The standard plot of a small group of people trapped in a room or maze is utilized here (see the old Twilight Zone episode Five Characters in Search of an Exit and the later film Cube). In this TNG episode, it's 4 characters: Picard, an alien female ensign from some other ship, an alien intellectual and an alien primitive. 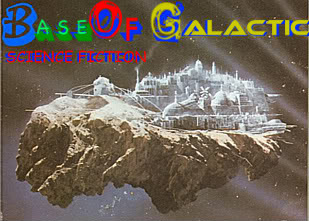 They were all transported to this 'container' by unknown alien forces. Besides the basic need to find a way out, the 4 prisoners need to find out why they are there and to avoid killing each other. The twist here is that these 4 persons have been replaced by duplicates in their normal lives. The 'other' Picard is a lot like the real Picard, except for some subtleties - he's more casual, more carefree and some of his actions don't make much sense, like he's going through some motions. He orders the Enterprise to slowly proceed on some unplanned trip, gets a bit romantic with Dr. Crusher and then gives himself completely away by singing songs in Ten Forward (where's Guinan?). Riker begins to get a bit worried and calls for an impromptu meeting with all the other top officers. 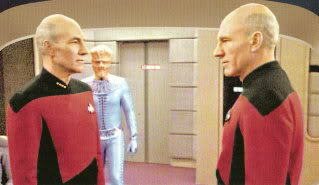 TNG Trivia: there were also two Picards in the previous episode Time Squared (2nd season). ---Also, didja know? 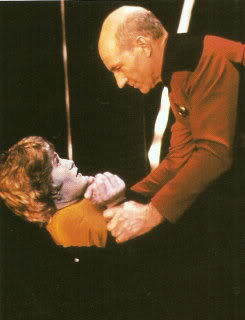 Picard's cabin # is 3601, on deck 9.